What a great vacation and Austin is the best town ever! Even though Jesse and I didn’t have access to the SXSW classes, we were able to enjoy free music played on streets and in bars. Texans as always, are friendly and fun and we partied liked two kids at Disneyland. I’m still detoxing from all those freshly squeezed margaritas I developed a fondness for. It's a bit sad to be back in cold Coeur d’Alene, but nice to hang out with my parents for another week while I finish this real estate course. Then finally, I go home to Moscow Friday evening. For a while at least. Why did Julie talk me into this again? I’ve been living out of a suitcase for four of the past six weeks. Oh, because it’s good for me. I’m trading fresh green summer salads and grilled Tex-Mex for steamy soup to fight this chilly rain and sleet. Outside my bedroom window the forest floor is still blanketed with snow, and I’m already missing the warm Texas weather. So for now, soup will be my comfort. 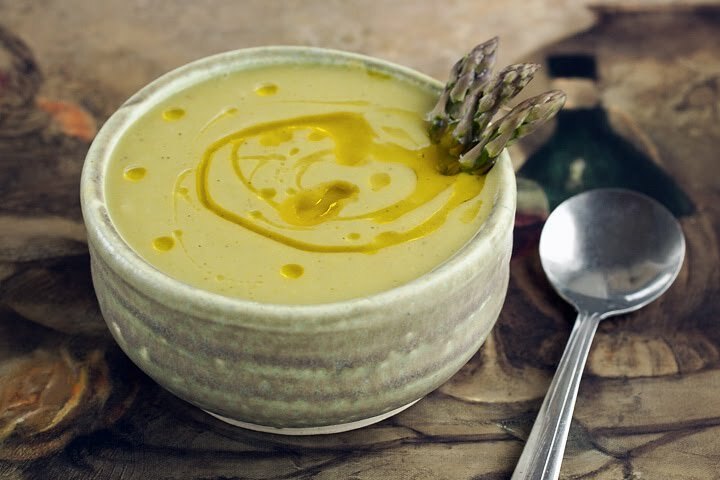 Light, fresh, healthy asparagus soup. Trading out the standard cream for potatoes, I lightened up the calorie load and packed in more nutrients, creating a soup that’s both good and good for you too. Fines herbs is a mixture of several different fragrant green herbs. If you won't use it often, for under a nickel you can usually buy the amount you’ll need in the bulk section. 1. Warm the olive oil in a large soup pot over medium high heat. Add the onions and sweat until softened, about 5 minutes. Add the asparagus and potatoes and cook for another 5 minutes until the asparagus is cooked through. 2. Add the broth, salt, herbs, cayenne and black pepper. Simmer until the potatoes are tender. About 10 minutes. 3. In a blender or food processor, puree the soup in batches. Serve with a drizzle of olive oil if desired. Ooo that looks very healthy and tasty. LOVE that photo too. Just gorgeous. You are so talented Laura. I love Austin too! I love running along the river. Stoked on this light and healthy soup. Perfect for spring and getting into sumer shape! I have such a love/hate relationship with things that are "good" for me. Like studying. Sigh. Mmm hand-squeezed margaritas. Those babies are hard to come by. And oh so yummy. I love this soup. So thick and creamy...and yet so good for you. That's what I'm talking about. I could never live out of a suticase for weeks...I crave my couch and refrigerator..my own couch that is. I love the earthy tones here, makes me really want asparagus and fiddleheads for some reason. Glad you enjoyed your trip and your drinks!! Nice recipe, and olive oil drizzle! Yuuuummm. Soup is so great on cold days. I love Coeur d’Alene! We go up once a year to visit family and the theme park. It's beautiful there. I'm not crazed about potatoes...would it be okay just to take them out? It looks so great! Charissa you can, but you may want to replace it with some milk or heavy cream to taste. Potatoes add that creaminess without the calorie load to this soup. Chelsea that's awesome you visit up here! Charissa I just thought of something. You might be able to use a pound of cauliflower in the place of the potatoes too. glad you had fun in Texas! did you happen to have a mexican martini at Trudy's? That is a must for your next visit. Good luck with the course Laura. And keep warm, at least you have summer to look forward to and yummy soup to help you along in the meantime. Hubby wrote me a Texas round-up to make up for not taking me to SXSW (I know, I should really learn how to negotiate huh?) :) Have a great weekend. Laura, I love asparagus soup and I love potato soup, but I never thought of combining the two. This looks great! My asparagus should be ready to harvest in the next three weeks, so I am saving the recipe to make it then. Thanks so much for sharing it! I'm so glad I found your blog from a link on Whistlestop Cafe Cooking. ah yes, spring I've been waiting for you! you know i used to hate asparagus growing up but somehow came to love it as I do today. this soup looks super delicious, especially with your lovely drizzle of oil on top! I've been to Coeur d’Alene but never Texas. I think it would be hard to give up those margs too. This soup looks fantastic! I made this soup for lunch today, and it's definitely a new favorite. YUM!!! Thanks for sharing the recipe! Thank-you for telling me about the soup! I'm happy you liked it.